I was looking for some creative inspiration during a recent logo design project. 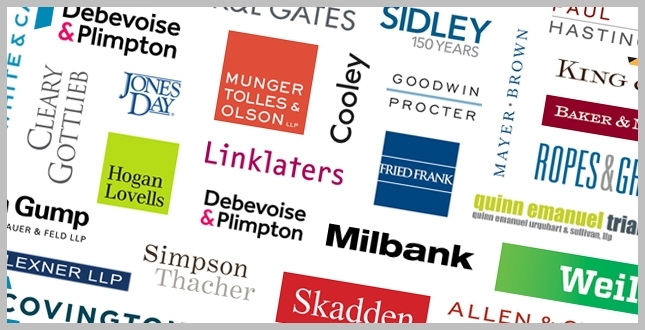 So, I gathered the logos of the top 50 law firms and examined them with a critical eye. Here’s what I found: sameness in abundance. I was surprised to see that the majority of large-firm logos are still relatively simple text treatments accented by muted colors. Flourish and whimsy are in short supply. Judge for yourself. Below are the logos of the top 50 firms according to the 2016 Vault Law 100. I’ve divided the logos into three categories: Plain Text, Treated Text, and Iconographic. Are these logos a vestige of a less competitive era, during which differentiation wasn’t important? Is there any business justification for sameness in today’s marketplace? As competition intensifies, will firms be more likely to embrace unique and remarkable graphic identities? As for the logo design project, the client and I concluded that it made sense for them to clearly differentiate themselves from the big guys with whom they compete. Fortunately, they were open to new ideas. Above is the final logo. The client, Herrick Feinstein, is a 130-attorney firm in New York. This style of simple, one-line, single-color text treatment is the longtime industry standard. Outliers are trying to push the envelope by using modern fonts and bold colors. Kudos to Linklaters for using hot pink to spice things up a little. It seems to me that British firms are much more willing to embrace a bolder look than are their American counterparts. This style of logo puts a fresh spin on the classic format by employing multiple colors, line rules, and multi-line layouts. These certainly have more personality than the previous category, and firms such as Weil, Gotshal & Manges and Hogan Lovells have developed standout branding. But the more progressive logos in this group only underscore how the majority remain very conservative. This style of logo incorporates visuals, independent of the firm names, to elevate branding beyond simply text. These logos express a modern corporate paradigm, in which firms are looking to embrace branding that distinguishes them from the competition. Big props to Goodwin Procter for raising the bar with their new rebrand. Does the old-school text-only logo still hold up? Will increased competition in the legal market usher in a new wave of bold logo design? Is there a firm not represented here that’s worth discussing? Leave a comment and let me know. 29 comments... read them below or add one. I can’t believe that the new Orrick logo (which was unveiled just a few weeks ago) is so similar to the O’Melveny logo. Even when law firms try to do something different (like adopting an icon logo) they end up looking the same! Hilarious. I love the Herrick logo. Elegant and practical. Nice work guys. The other logo I love is the new Goodwin Proctor logo. The two best logos in the legal industry are both orange single-letter icons. Considering how law firms work, I fear that we are about to see an avalanche of orange letter-icon logos. God help us. Thanks for your kind words. I really like the Goodwin logo also! For the record, the Herrick logo was unveiled several months prior to the Goodwin logo. It appears that it’s entirely coincidental that two orange letter-logos debuted in quick succession. That said, it will be interesting to see if there are copycats. I think we so very often can not help but be lemmings. The old guard that lingers can not get out of the box and raise themselves above the noise! Kudos to Goodwin and Herrick for effort. It would be interesting to know which design firms are behind the brands and whether or not that is helping to drive the homogeneity we see. We’re all also saddled with the “Name, Name, Name & Name” type of basic naming convention, which means the most creative thing we can do is use only one of the names or an abbreviation- ugh. Throw in a general resistance to retail-style branding from senior partner decision makers and you’ve got a recipe for blandness. I have grown tired of the ampersand, but I’m guessing there aren’t many other ways to treat “and” graphically. Writing it out seems cumbersome. Our logo uses an icon and a shortened name, sans ampersand. It works for us…for now. I agree. The ampersand can be tiresome. I especially hate it when firms make it big (and use it as a graphical anchor). This is an amateur move used mostly by smaller firms. In lieu of the ampersand there is always the plus (+). We used a plus when we designed the Kegler Brown logo. It makes me crazy that we are so design limited in law, but that is also a result of client preferences, who *want* staid and boring gravitas in a lawyer. When design choices are voted on agreed upon by committee, it is any wonder why law firms are mired in an ocean of sameness? Bold decisions require leadership far more decisive many law firms can muster. Nice post Dion, I really enjoyed it. Great post and the categories are very helpful in separating the wheat from the chaff. As Adrian said, working with a committee makes it extremely difficult for an iconographic logo to emerge in a puff of white smoke: Habemus logem. As for Orrick, they have been emphasizing the O for more than 10 years. Janet — you and Adrian are correct. Most much of the sameness in legal marketing results from committees. Getting a dozen lawyers to agree on anything can be a challenge 🙂 As for Orrick, they just unveiled a tweaked logo a few weeks ago. I’ve posted the before and after below. Fascinating to see them all grouped together…thanks for taking the time. Though we are a significantly smaller firm, I feel that our current logo at Wyrick Robbins holds its’ own in this group quite nicely. Thanks David. Yes, Wyrick Robbins logo is awesome! I’ve inserted it below so others can see. Sameness — not surprising. Law firms have never been hotbeds for creativity. If I had to pick a favorite from these, I’d go with Quinn Emanuel. Adding “trial lawyers” to the logo helps define and set the firm apart. I worked in brand management in the sports industry for several years and most franchises had primary, secondary and wordmark logos. Although I suspect that may be more options than a law firm needs, considering the nature of branding in the legal industry, I do think law firms would be better served to have more than one logo option. I think this is especially important when a firm has three or more named partners or very long names. I can only imagine the nightmare that is working with some of these epic landscape logos. It’s not all that surprising that the logos are mostly dull, boring and all look alike. The same can be said of much of law marketing. Very interesting article Dion. Thanks! Vanilla vanilla vanilla… Isn’t the point of marketing to differentiate yourself and doesn’t your logo need to stand out? Gimme’ something bright, edgy, popping, and powerful. Great post Robert. Always enjoy the Great Jake experience. Regrettably logo aesthetics are totally irrelevant for 99% of the brand experience companies/ firms etc. are trying to create. The logo BECOMES you, not the other way around. Did Phil K build Nike as a result of the swoosh? No. Or that a specific font type and aesthetic treatment opened the gate into the Magic Circle? Just make sure the logo doesn’t look like $hit-and then live, breathe and ‘be’ the iconic perception customers/clients think you are. That being said-if I was at Axiom…I may have a suggested a slightly different direction given the disrupter status they are striving for in our industry (I reserved the 1% for this instance…). Sorry Dion. Meant kudos to you…still early here in Calgary. Interesting. I would like to see a discussion of the need to create an image only logo that is used for company identities in places like Linked in, and how these are introduced to an existing firm identity, especially for companies whose text based logos are not readable at mobile sizes. Some firms have done this addition well while others stil lag. I like the classic stylings of the Willkie logo but I might be subconciously biased since I used to work there and it still looks familiar. The DavisPolk logo and all the logos in the top half of the second section look terrific. The bottom half of the second section is a different story. Placing the firm name in a colored box limits how you can use the logo and doesn’t add anything. Alas poor Orrick! I love their new logo. It’s fresh, clean and I think it stands because it’s a controversial single word. I’d like to see more law firms break away from tradition. Law firm logos all look about the same because any full service business law firm does everything. They have no particular practice area they can depict graphically. They just have their firm name. An ampersand is the closest they come to anything visually interesting. Your blog posting drove home the sameness of most law firm logos. I’ve taken a different approach with my small law firm dedicated exclusively to commercial real estate work. My logo is a generic representation of tall commercial buildings, with my firm name across it. My graphic designer offered me five color schemes. I couldn’t decide, so chose “all of the above.” We switch the color schemes every time we use the logo. We have done variations on the logo for advertising, wine bottle labels, mouse pads, coasters, umbrellas, and other gifties that our clients seem to appreciate, or at least say they do. For one year’s holiday card we festooned the logo with ribbons and bows. Another year we made it the centerpiece of a galaxy. No big firm could ever have this much fun with its logo. Thanks for your comment, Joshua. You are absolutely correct — it’s difficult for large, diverse, general practice firms to do anything creative. Designing a unique logo that will appeal to lots of different constituencies is difficult (but not impossible). I’ve posted Joshua’s logo below. It’s clearly different than the logos of the Top 50 firms! Hi, It’s a interesting article about law firm logo. There are plenty of logo available in the market but we going to select our suitable once. I choose my logo related to my firm name. It’s a simple logo. I do think law firms would be better served to have more than one logo option. Well, I Just Loved it. Thanks for sharing an informative post. Awesome law-firm-logo-landscape topic.Thanks Again. Awesome.Law of Attraction is a Law of the Universe, as powerful as any other Law of life. In simple words, Whatever you ‘Think’ and ‘Feel’ becomes a Reality in your Life.